Plug it in, save data , files, mp3 songs, pictures and more and carry this awesome Promotional Rubiks Cube USB Memory with you at all times. 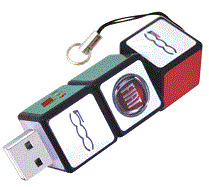 this useful company freebie or business gift stays with your customers and clients. transfer and reliability for safe file storage.